So, Aereo's streaming TV service is pretty cool. It re-broadcasts standard over-the-air television signals to your mobile device, assuming you live in one of the coverage areas. If you want to enjoy your incredibly convenient TV Xzibit-style, and put your TV in your TV (set), you'll soon be able to. According to a new press release, the Aereo app will add support for Google Chromecast on May 29th. Hooray! Of course, that assumes that Aereo's $8-a-month subscription service is still around at that point. Broadcast networks have been trying to shut down Aereo ever since it began, and the Supreme Court is scheduled to hear their appeals case on April 22nd. Aereo argues that its rebroadcasted TV is covered under the same set of copyright laws that make DVR-style set-top boxes like TiVo and Slingbox legal. The Second Circuit court of appeals agrees, but a consortium including CBS, NBC, ABC, and FOX appealed the decision, claiming once again that Aereo's business model accounts to a free public performance of their content, and that the company should pay the same fees as cable and satellite TV providers. It may seem like small potatoes, but Aereo's disruptive business model is causing waves across both the television industry and the world of intellectual property. Aereo has already been blocked by injunction in several states, and the National Football League and Major League Baseball have threatened to end over-the-air game broadcasts altogether if Aereo is allowed to continue, switching to an all-cable system. If the Supreme Court finds Aereo's unique method of content delivery infringing, it's essentially curtains for the young company. In law as in opera, it ain't over till the fat lady sings. We'll be watching the Court's deliberations with interest, because a victory for Aereo means more options for Chromecast users and cable-cutters in general. Defeat means a new lease on life for bunny ear antennas. 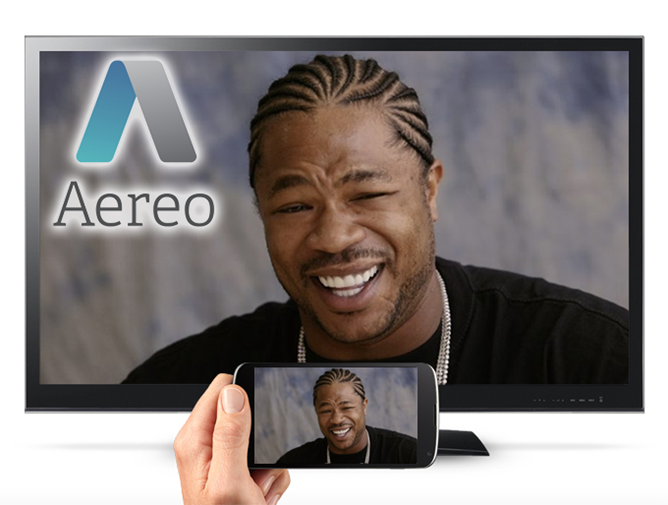 NEW YORK, NY--(Marketwired - Apr 10, 2014) - Aereo, Inc., today announced that its groundbreaking cloud-based antenna and DVR technology would be Google Cast Ready on May 29. Current Aereo members and consumers residing in active Aereo markets will be able to download (or update) the Aereo app for Android™ in the Google Play™ store, which will include support for Chromecast. Aereo CEO and Founder Chet Kanojia made today's announcement at Fast Company's Innovation Uncensored conference in New York City. "The way people watch and experience television is changing and Google is a pioneer in providing consumers with more choice and flexibility in how they access and experience that media," said Aereo CEO and founder Chet Kanojia. "We're excited that Aereo will be Google Cast Ready this May. Consumers deserve more options and alternatives in how they watch television and our team is committed to providing consumers with the best experience possible using Aereo's innovative cloud technology." In order to use Aereo's technology with Chromecast, consumers must download the Aereo app for Android in the Google Play store. Set up your Chromecast device with your television; launch Aereo and the "cast" icon will appear in the app. Aereo's remote (cloud-based) antenna/DVR technology makes watching television simple and user-friendly. Using Aereo's technology, consumers can pause, rewind and fast-forward any program that they are watching live, or save a program for future viewing. Aereo's technology works with compatible 'smart' devices from tablets to phones to laptop computers. Aereo is currently supported on iPad®, iPhone®, iPod Touch®. The Aereo app for Android (currently in beta) is available for download for devices running Android operating system version 4.1 or higher. Aereo is also supported on Chrome for Mac® and Chrome for Windows®, Safari®, Internet Explorer® 9, Firefox®, Opera™ Software, AppleTV® (via AirPlay®) and ROKU® platforms. Aereo membership begins at $8 per month, for access to Aereo's cloud-based antenna/DVR technology and 20 hours of DVR storage. For an additional $4 per month, consumers can upgrade their membership and receive 60 hours of DVR storage for a total of $12 per month. Consumers who join Aereo will currently get their first of month of access for free.